Its a wonderful time in America, where we all get together with family and contribute to the obesity rate of this country. Well, maybe not all, but a significant amount of us americans do. This is a time of year when we remember the things we are thankful for in our lives. The first thanksgiving was a time when the first settlers thanked God for their harvest and celebrated with a feast. We should all remember to thank God for our blessings. 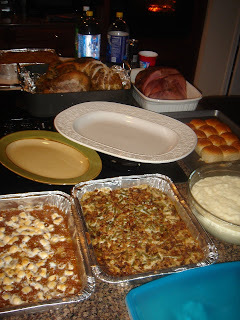 I was blessed to be with friends and to enjoy a great meal. 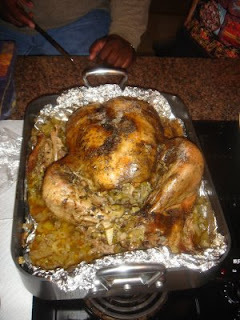 Here is a picture of the Turkey and everything else we ate. Have a great day.